Ownership / Access: Museum, Open to visitors. Notes: Bohus Fortress (also known as Baahus or Bahus, originally: Bagahus) lies along the old Norwegian-Swedish border in Kungalv, Bohuslan, Sweden, north east from Hisingen where the Gota river splits into two branches (20 km (12 mi) north of Gothenburg). It commands the surrounding area from a cliff 40 m (130 ft) high, with the river forming a natural moat around it. The fortress was attacked or besieged 14 times, but was never captured. During the Northern Seven Years' War, in 1563-1570, it was seriously damaged. This occurred in 1566, when 250 Swedish soldiers successfully stormed the northeastern-most tower. The Norwegian commander sent in a volunteer to blow up the ammunition stores underneath the tower, killing the Swedes and repelling the attack. As a reward the family of the volunteer got a piece of land which is still owned by the descendants of this volunteer. The Norwegians rebuilt the fortress of stone and brick, and reinforced it substantially. The reconstruction immediately after the war was directed by Hans Paaske (Paske) from the Netherlands. In 1593-1604, similar to the construction then undertaken at Akershus in Oslo, Bohus was upgraded to a bastion fortress. A new outer fortification was raised. This construction was one of the early works of Hans van Steenwinckel, also from the Netherlands, who later became noted for his Dutch Renaissance style design in Denmark. 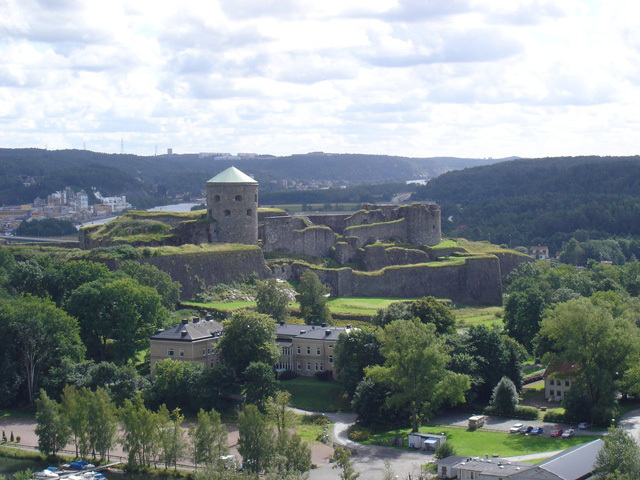 As Swedish invasions continuously threatened Norwegian Bahuslen during this time period, the improvement of the fortifications went on for years. For example, starting in the summer of 1651 and until the autumn of 1652, the Dutch engineer Isaac van Geelkerck supervised the construction of two corner towers along the south facade and a new ring wall that was constructed around the arsenal building. At the end of the 18th century it was decided that the now unused fortress should be demolished. Demolition crews worked at the fortress for two months, after that the money allocated for the job had run out. Residents of the nearby town of Kungalv used the dressed stone from the fortress to build houses. However, much of the fortress is still intact, including the large northern tower, Fars hatt ("Father's hat"). As of 2015, the fortress is a museum open to visitors during summer.